Last night on The Rachel Maddow Show, your host/girlfriend explored how anti-abortion activists are attempting to chip away at abortion rights through state legislation and good news! It isn't entirely grim this time. Yesterday, the Supreme Court rejected Oklahoma's draconian abortion-ultrasound law that would force women who are seeking to terminate a pregnancy to undergo a transvaginal ultrasound and examine the ultrasound photo with her doctor before having the procedure. Thankfully, the Supreme Court found the law unconstitutional and as an assault on Roe v. Wade. 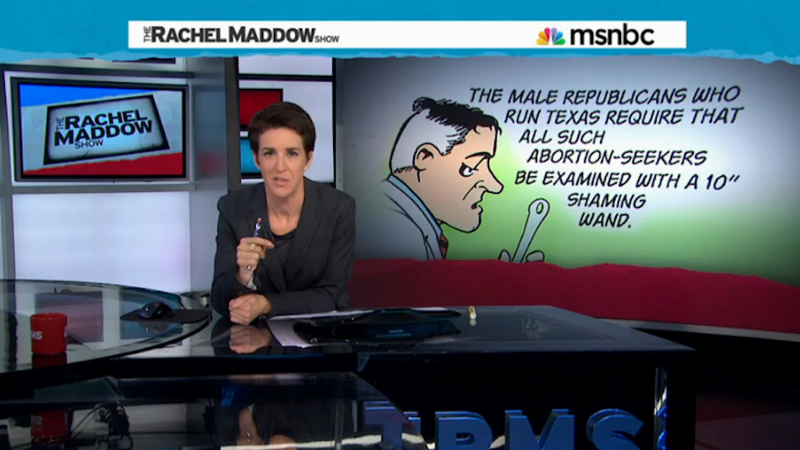 Unfortunately (it's not all good news, sorry), Maddow points out that there are several states (Texas, North Carolina and Wisconsin, for example) with similar laws that are still infringing on women's reproductive rights. "The way that Republican state legislators and governors have become more aggressive than at any time since Roe v. Wade in terms of mounting new legal restrictions on access to abortion...Obviously, they think that they are gonna be able to chip away at abortion rights in a state-by-state way without ultimately getting to the question of the constitutionality of abortion broadly," Maddow said, speaking to president of the Center for Reproductive Rights Nancy Northup. "Is this leading to a Roe v. Wade challenge or are they trying to avoid one and they think they can just get closer to it without hitting it?" "Unfortunately, I think it's both/and," Northup answered. "I think they are both trying to see if they can chip away at Roe so much that basically the tree trunk falls and at the same time, they're also happy to get back up to the Supreme Court and try to make a full run for having Roe overturned and people have to understand the seriousness behind these laws...The real impact of them is what we need to be paying attention to." Northup went on to describe how a third of clinics in Texas currently cannot see patients as a result of the state's anti-abortion legislation. When asked whether or not she thought the Supreme Court would uphold the precedent set by Roe v. Wade, Northup was uncertain, but hopeful. "It's hard to read what the Supreme Court is going to do," she responded. "Justice Kennedy was in the majority in the Planned Parenthood v. Casey decision which reaffirmed Roe. I believe that the facts that we're seeing in states like Texas — if a case like that gets to the Supreme Court — that we're going to — I hope — have Justice Kennedy see that the facts show that women need access, that these kind of laws are underhanded ways of doing what the Supreme Court has said you can't do...I am hopeful that the Court will see that women need their access to healthcare and that they need to stand by the strong decision that they had made in Roe."